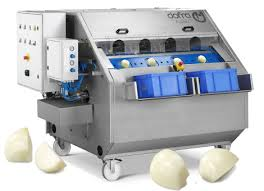 The OD-6000 is an onion de-coring and dividing machine that can be operated simultaneously by either one or two operators. The machine divides the onions into two or four segments and is also suitable for de-coring and / or segmenting apples, tomatoes and sweet peppers. The maximum capacity of the machine is approximately 5,500 units per hour. It is possible to process onions with a diameter from 55mm up to an including 120mm.